1519, the Spanish explorer Alonso Alverez de Pineda led an expedition along the northern shores of the Gulf of Mexico. He discovered the mouth of a great river- in all likelihood the mighty Mississippi. The first explorer to travel down the Mississippi River to its mouth was Frenchman Sieur de LaSalle. In 1682, he took possession of "the country known as Louisiana," naming it in honor of his king, Louis XI V.
In a secret treaty in 1762, France ceded its territory west of the Mississippi to Spain. Colonist in Louisiana didn't learn of the transfer for almost two years! In 1763, great Britain acquired parts of Louisiana east of the Mississippi from France and Spain in the Peace of Paris that ended the French and Indian War. On April 30, 1803, the United States purchased the vast Louisiana territory from Napoleon for $15 million. That purchase more than doubled the size of the United States. In 1810 colonists took control of the area east of the Mississippi River. It was part of Spain's West Florida Territory. That same year this republic joined the United States as part of the Louisiana Territory The area is still referred to as the Florida Parishes (Louisiana is divided into parishes instead of counties.) The flag is known as the "Bonnie Blue." On April 30, 1812, Louisiana became the 18th state to join the Union. William Charles Cole Claiborne was elected its first governor. The longest siege in American military history took place in 1863, when Confederate troops at Port Hudson held out for 48 days. Their surrender, five days after the fall of Vicksburg, marked the end of Confederate control of the Mississippi River. In 1912, the Louisiana State Legislature officially adopted the present state flag. It depicts the state bird, the Eastern Brown Pelican and the state motto: Union, Justice and Confidence. 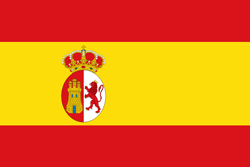 In 2001, the Parish President officially adopted the present parish flag. 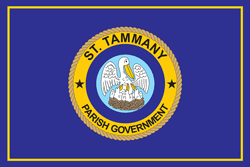 It depicts the seal of St. Tammany Parish Government on a blue background symbolizing knowledge, integrity, trust, loyalty, & confidence. The gold band represents quality, wisdom, and wealth.